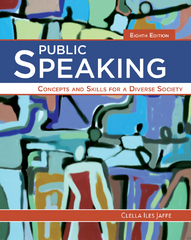 Public Speaking 8 Edition PUBLIC SPEAKING: CONCEPTS AND SKILLS FOR A DIVERSE SOCIETY, 8e equips you with the training and tools to be an effective public speaker and listener in a world of constant cultural, political, and technological changes. The book combines 2,500-year-old principles with up-to-date research into concepts, skills, theories, applications, and critical-thinking proficiencies essential for successful listening and speaking. Giving you a heightened awareness of and sensitivity to your audience, discussions of classic public speaking topics are grounded in an awareness of the impact of cultural nuances-ranging from gender differences to co-cultures within the United States to the traditions of other nations. Ethics are also emphasized throughout. Coverage includes the latest information on listening competencies, legacy journalism, native digital news outlets, MAPit, powerful language forms, and more. In addition, numerous samples speeches and hands-on exercises help you develop and sharpen your speechmaking skills.